You don’t need to be an athlete to experience back strain. The most basic of movements, even a sneeze, can cause the muscles in your back to overstretch or extend beyond their normal range of motion. This can result in tiny tears in the muscle fibers, also known as a back muscle strain. This type of injury, even when very minor, can be very painful. 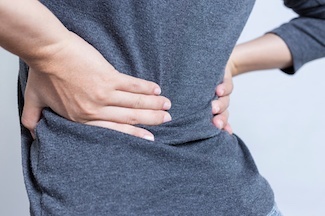 The unfortunate reality of back strain injuries is that they cause a lot of discomfort. Sometimes the pain is so intense that it is difficult to perform routine activities. If this is the case, you might want to try over-the-counter pain medications to help alleviate discomfort and reduce swelling in the muscles. If this level of pain medication is not sufficient, talk to your doctor about a short course of prescription medication for the early phases of recovery. Applying cold therapy immediately after a back strain injury is one of the best ways to control the body’s natural inflammatory response. This can help prevent excess swelling and reduce pain eliminating or reducing the need for drugs. Cold therapy is also beneficial for all other phases of recovery because it helps slow down cellular metabolism so that damaged tissues have an opportunity to heal. In addition to therapeutic cold, active compression helps your body remove excess fluid from the injured area and promotes healing by stimulating the flow of freshly oxygenated blood essential for the tissue repair process. After the initial inflammatory response has subsided, typically after several days, you can also apply therapeutic heat to loosen up tight back muscles and provide a soothing effect. You can apply heat therapy by taking hot baths or applying a heating pad to the affected area. Many people find that therapeutic heat helps improve range of motion and relax sore muscles. Adding Epsom salt to a hot bath can also contribute to deeper relaxation. As you start to recover and regain range of motion, a physical therapist can teach you stretching and strengthening techniques to gain flexibility and build up the surrounding supporting muscles to help prevent future injury. A physical therapist can also help you learn how to modify your posture to reduce your risk of back strain after you have recovered. In addition to exercises, a physical therapist might also use devices such as a cold therapy system or electrical stimulation to accelerate your recovery. Manipulating the muscles and tissues can help improve back strain recovery by increasing blood flow and flushing away toxins. A physical therapist might provide therapeutic massage as part of his or her course of treatment, or you can go to a massage therapist. Be sure that the provider you select is qualified and has experience with massage for injury recovery. Although all of these back strain treatments can work well on their own, using a combination of approaches is most likely to result in a faster, more comfortable recovery. If you’d like to learn more about cold and compression therapy and how it can help you recover from back strain, ask a local physical therapist about Game Ready or contact us today.